Ennead Architects and Heintges & Associates recently completed construction on the 475,000-square-foot Belfer Research Center, Weill Cornell Medical College’s latest expansion to Manhattan’s Upper East Side. The building’s facade includes a unique double skin system on the southern face to define the medical campus’ identity, provide ample natural light without glare to the laboratory spaces, and create a highly efficient envelope. Heintges and Ennead previously worked together on the neighboring Weill Greenberg Center in 2007, said Todd Schliemann, partner in Ennead Architects and designer of both WCMC’s Weill Greenberg Center and new Belfer Research Building. Among the strategies employed in that project was the use of custom ceramic fritting to cut down on sun loading and glare. 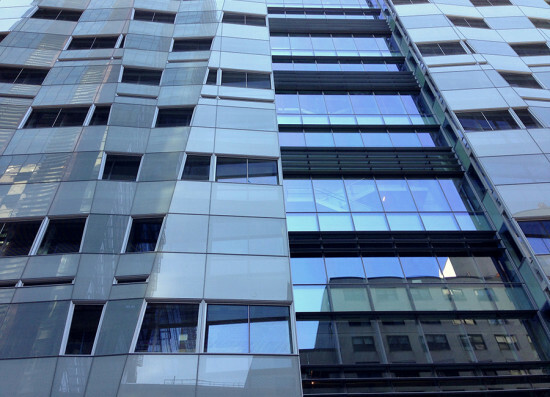 The team repeated that strategy at Belfer, applying ceramic frit to both sides of the building’s outer curtain wall. The exterior of the outermost layer features a white frit pattern designed to reflect sunlight, while a black frit pattern on the interior surface helps reduce glare and increase visibility through the glass. The double curtain wall produces a chimney effect that reduces cooling loads. For insulation, the inner layer is composed of argon-filled insulated glass units. “We conducted a lot of thermal analysis to minimize bridging through the outriggers,” said John Pachuta, a partner at Heintges. The framing system for the inner wall is thermally broken; a layer of mineral-fiber insulation behind the frame helps improve performance. Permasteelisa manufactured the 5-foot units in its Montreal facility. Glass from BGT was treated with an Interpane coating, and outrigger connections were affixed to the frame every 5 feet. The outriggers also extend to support the outer skin. For the outer wall, unitizing the unique geometries helped maintain the building schedule, despite its complex appearance. “We learned that even with a subtle shift in plane, you can still use standard parts and pieces,” said Schliemann. The team was able to reduce the number of IGUs and achieve a more monolithic appearance by using larger, 10-and-a-half-foot panels, ultimately requiring fewer joints. 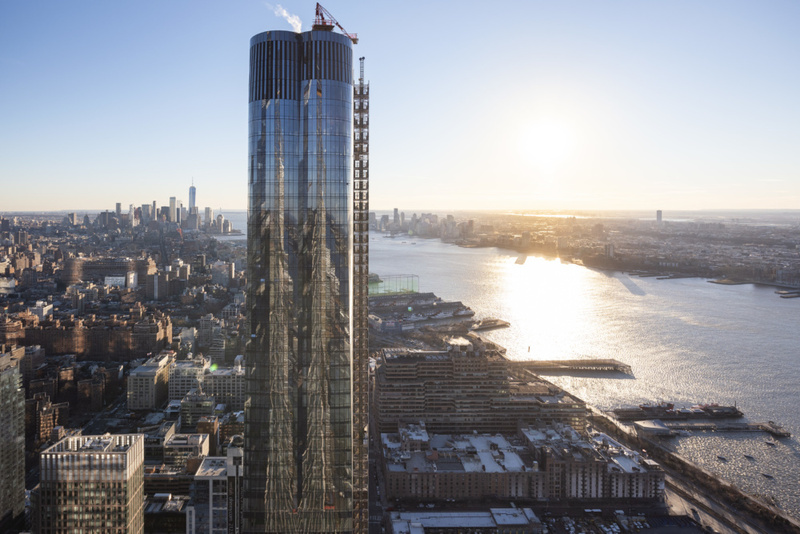 The grid breaks into 21-foot repetitions, in order to accommodate window washing balconies that also provide faceted cavities in the exterior curtain wall. The cavity between the two skins measures between 18 and 25 inches to accommodate an aluminum catwalk, which is supported by the inner wall’s outriggers. Access points to the catwalk can be reached from the interior for cleaning and maintenance. With increasingly erratic environmental conditions in the Northeast corridor, the entire system had to be secure yet resilient. “We considered having support members starting from the base building structure—from the perimeter beams or columns to extend through the inner curtain wall—but to reduce thermal bridging it was more effective to have outriggers extend through the weather enclosure,” said Pachuta. “Instead, steel outriggers support the catwalk and outer screen wall that are directly attached to the mullions of the inner curtain wall.” Mullions of the inner curtain wall are reinforced with steel, and are anchored to the outer wall at the edge of each unit. The faceted cavities produce good ventilation, but also leave the protected areas open for pigeons to nest. En lieu of standard bird wire, the team developed a custom steel frame with tensioned, horizontal stainless steel rods ¾ inches apart. Though the system keeps the sky rats at bay, the wire is no wider than a bicycle spoke and does not impede views from inside.